None of us live our lives in isolation, even if we sometimes might want to. 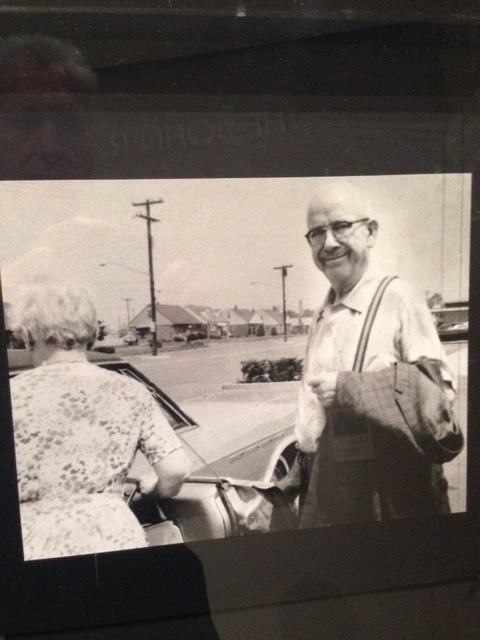 We carry with us the influences big and small of everyone we'd known, of everywhere we've lived. It's the same for artists. As a landscape painter I have worked all over the country, but always in the back of my mind is a palpable memory of the Western New York landscape I grew up in. 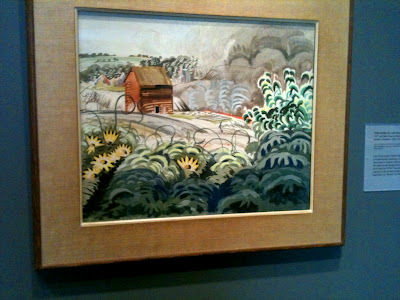 Charles Burchfield grew up in Northeast Ohio and moved to Buffalo, NY to take a job as a wallpaper designer. 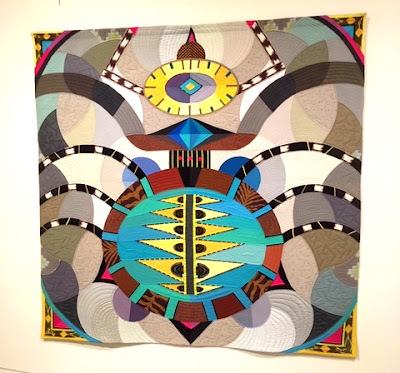 Despite becoming a nationally renowned artist he consciously made the decision to stay in Buffalo as the roots he had sunk there nourished his creativity. Naturally this is someone I wanted to know more about. 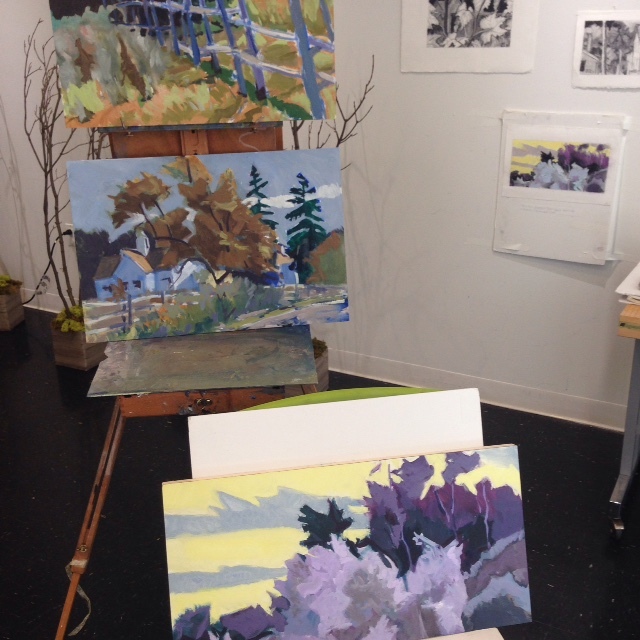 Over the last year as the Burchfield Penney Art Center's Artist in Residence I've made seven trips to study the legacy of Charles Burchfield. Last week found me once again in Buffalo, NY painting at BPAC and in the fields on the outskirts of Buffalo in an area where Burchfield himself often painted. 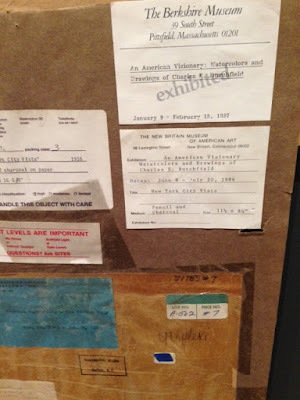 that used to be on the museum's framed pieces. 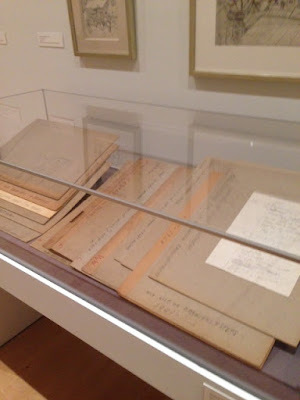 In addition to having the largest collection of Charles Burchfield's work, BPAC has an exhaustive archive of the artist's writings, notes, sketches, doodles and memorabilia. Heather Gring, the museum's Archivist organized some of their holdings into the exhibition Finding Aid: Making Sense of the Charles E. Burchfield Archives (through June 19, 2016). 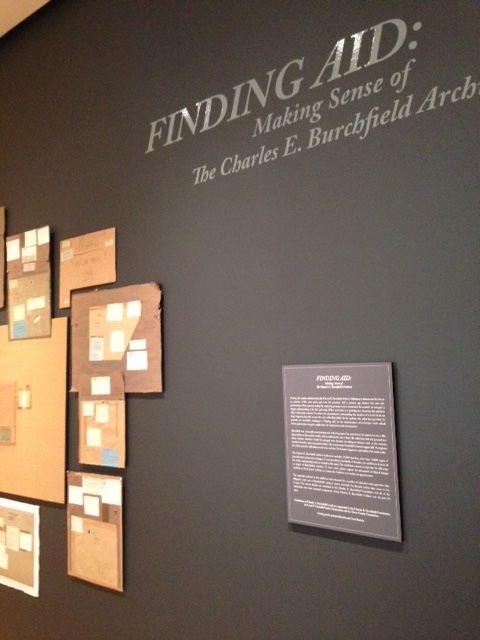 A giant wall-mounted collage of Burchfield's original backing boards that have been removed from the original frames of works on paper greets you when you enter the exhibiton's first gallery. They have all been replaced by more archival materials to preserve the work. 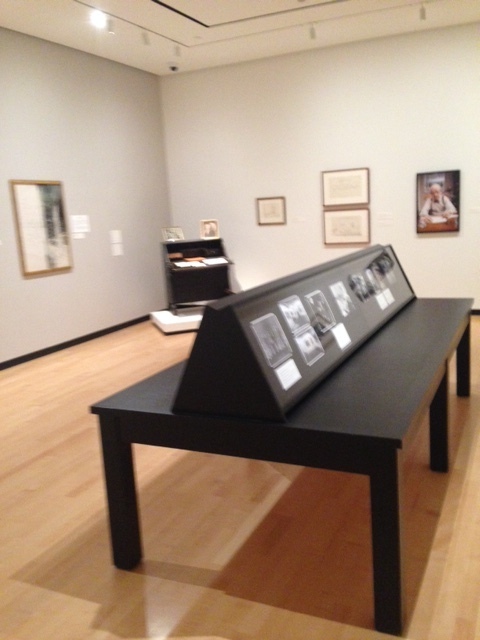 Facing them on the opposite wall are some of the drawings that accompanied the boards in the opening display. 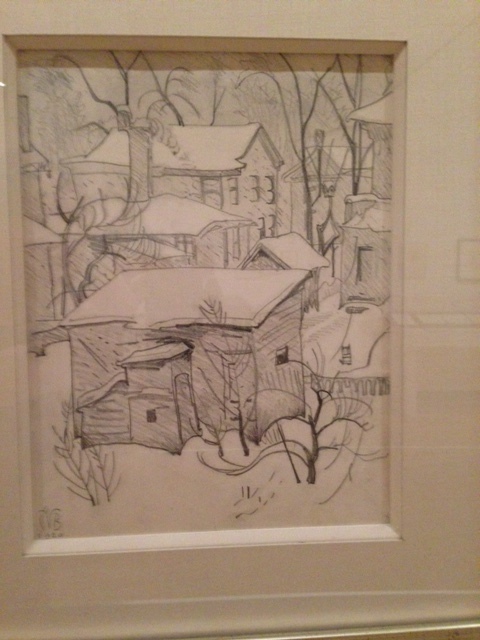 An early drawing he made while in the army. I did a double take when I came across this drawing. 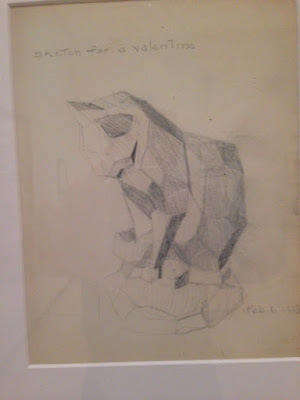 In my very first studio art class my Freshman year at Oberlin College I made a drawing of the very same plaster cast of a cat. 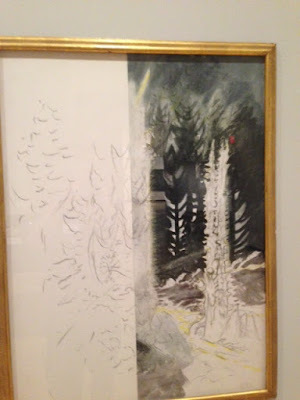 Perhaps this is something Burchfield worked on when he was a student at the Cleveland School of Art. related drawings together. They've been replaced by archival folders. A close up of one of the Burchfield's in the show. 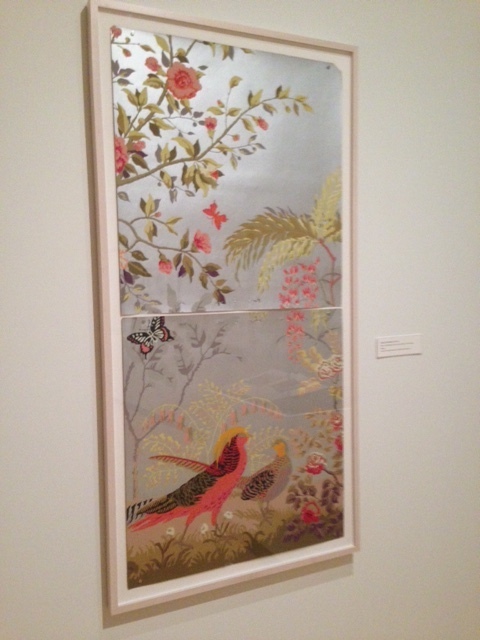 A sample of one of Burchfield's wallpaper designs. The exhibition features a giant photo of a group of the artists that exhibited with Burchfield (back row far right) at the Rehn Gallery in New York. 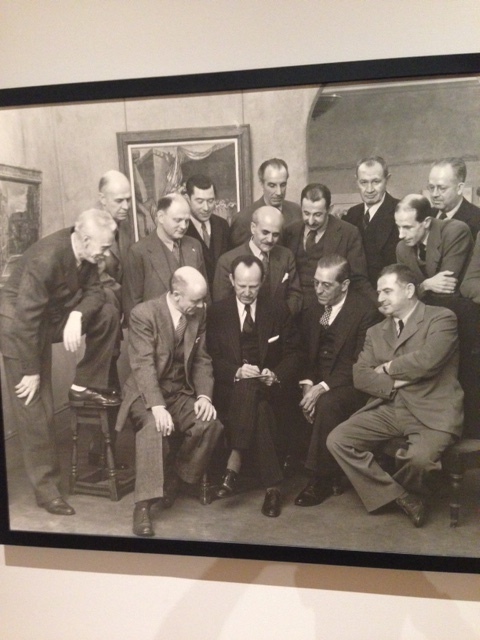 His friend and fellow artist Edward Hopper is in the back row at the far left. is getting into their car. but never got to complete it. 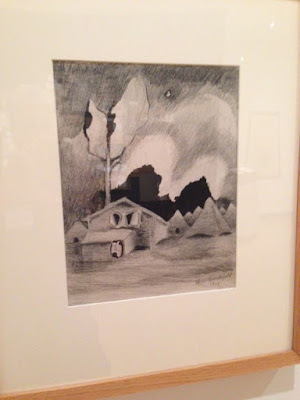 Few artists have left us with as much documentation and commentary on their work as Charles Burchfield. 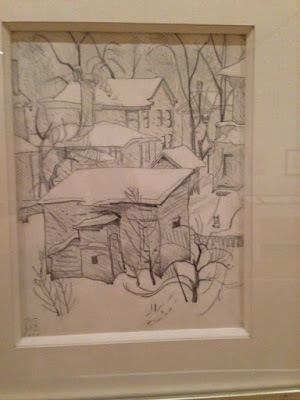 Any artist who has wondered about the fate their life's work once they are gone will find the careful archiving of Burchfield's legacy on display here genuinely heartwarming. This is what we would all hope for. 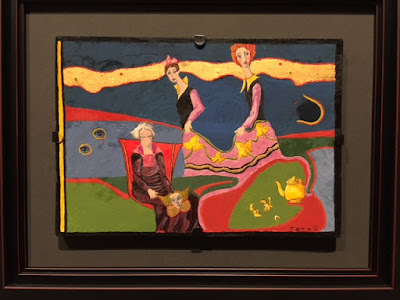 I had a planning meeting with Scott Propeack, the museum's Chief Curator, for an upcoming major exhibition of my own paintings at BPAC. It sounds exciting and I will be sharing details as we finalize our dates and plans. I am confident it will be an impressive exhibition. 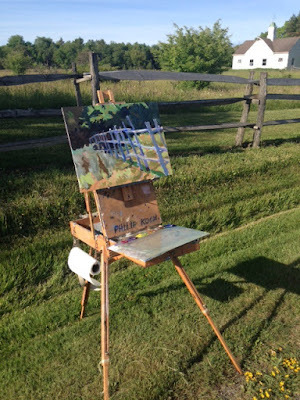 On this visit to Buffalo I spent most of my time working in oil paint. I used part of the museum's Classroom as a temporary studio. I spent most of my time this week southeast of the city in a rural field in East Aurora. Here's a photo of my work in progress of a split rail fence that I took just before packing up my paints and brushes to head home. 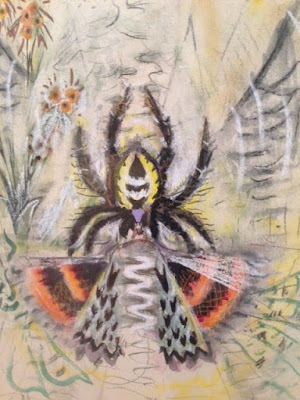 Shiborigirl, the spider I posted is a close-up detail of a much larger and very unusual Burchfield. He left it more as a drawing than usual. A fun piece. Thanks, Phillip, for the great posting! Someday when I'm in Buffalo, esp. if I can get my brother down from Toronto, we could visit BPAC with you and fill in many details, and share our many memories of all the time we spent with him. Of course, he was, first and foremost, "Grandpa" to us!! Peggy that would be great!